"is that her real name?" "...her last name is Danger?" Lets just say they had a great time with that (think stupid pick-up lines, lol). So, Gort. I decided to knit him for Alex for Christmas. 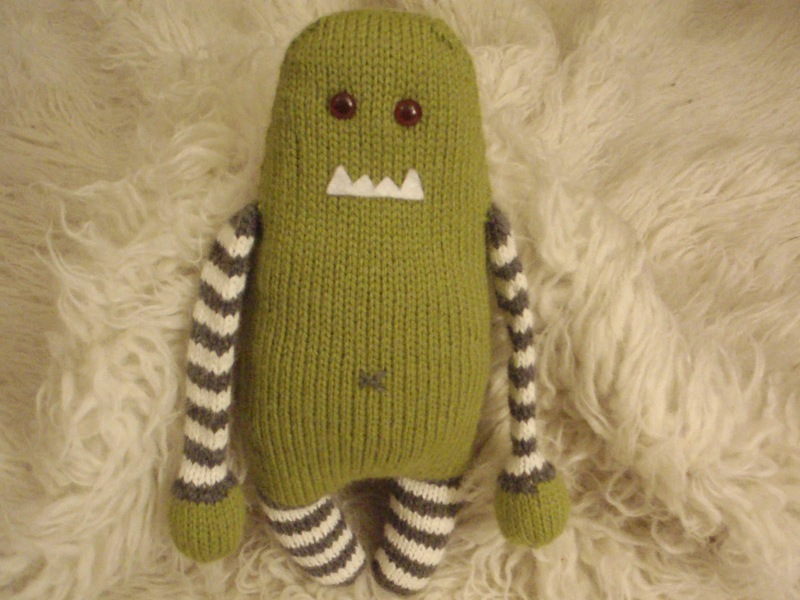 I've wanted to knit a monster for a long, long time. Check my Ravelry que and see for yourself. There are tons of them in there. But for some reason I just never got around to it. 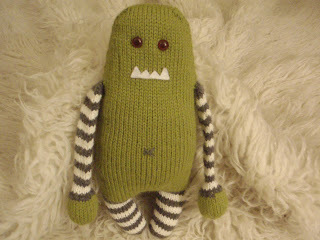 And I really should have because he was so much fun to make! It took me like...two days. 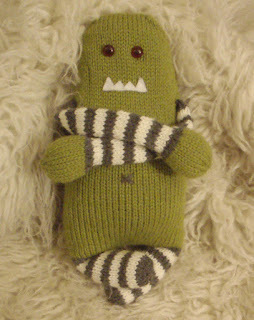 I spent a lot of extra time working on the stuffing, fluffing it out before I stuffed him (like Rebecca said) and it came out right the first time. 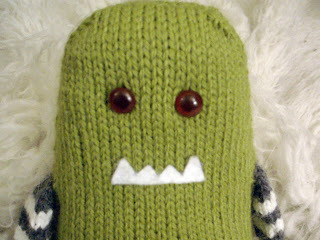 Then I went into the shop and took advantage of the many sizes of creature-eye buttons Naomi recently purchased. I think they look great! Gort is knit with three colors of Berroco Vintage DK. I picked up bags and bags of it this summer at the sale. I figured it was perfect kid yarn and I'm always knitting sweaters or hats or something like that for babies (or Alex) so why not stock up. I used wasabi (2165), snow day (2100), and cracked pepper (2107). The mouth is white felt attached with fabric glue. Honestly, I used minimal yardage. 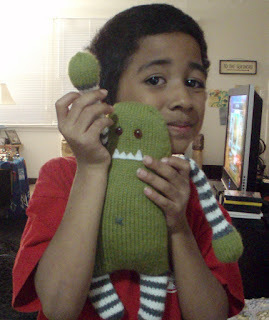 I think I used under half a skein of the wasabi, and that's the color I used most. I can definitely get a second monster out of what I have left over. I'm thinking of doing one of the others from the book in the same colors but in different combinations. This can easily get out of hand. Here are some shots of this guy from our photo shoot. You will notice that Alex is in one of them. Although I planned to give this to Alex for Christmas, I just couldn't wait. I wanted to make sure he even liked this guy before the big day. Now that I know he does, I've started work on the ninja he asked me for (from the Knitwits book). Anyway, enjoy the many faces of Gort. This monster is so cute!! I can't wait to see the other ones you make later! Too cute!!! 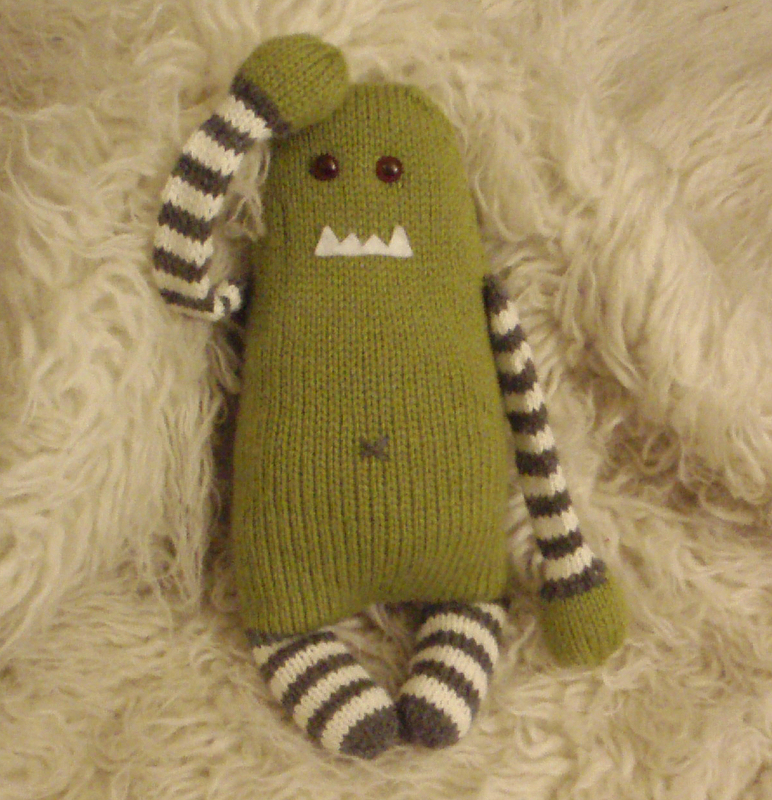 And the knitted monster's not bad either!